Each year we welcome thousands of Primary School students for School Tours and Discover Primary Science & Maths (DPSM) Days. Research shows that nature connection through outdoor play, learning and adventure is invaluable for the developing child and our woodland environment is the ideal setting. We will work with you to put together a memorable day for you and your students. We have lots of exciting adventure activities to choose from along with six SESE curriculum-based activities. Primary School Programme is available September-June. We book up fast for School Tour season so get in touch to secure your preferred date and preferred activities! As an accredited SFI Discover Centre, our DPSM activities focus on the investigation skills, the scientific-method, active data collection and problem-solving. DPSM Days cost €12pp and include three of the accredited activities. Programme runs September to April only. Participation in these activities can go towards the Awards of Science and Maths Excellence. Uses a problem-based learning approach to determine water quality using aquatic species as indicators. 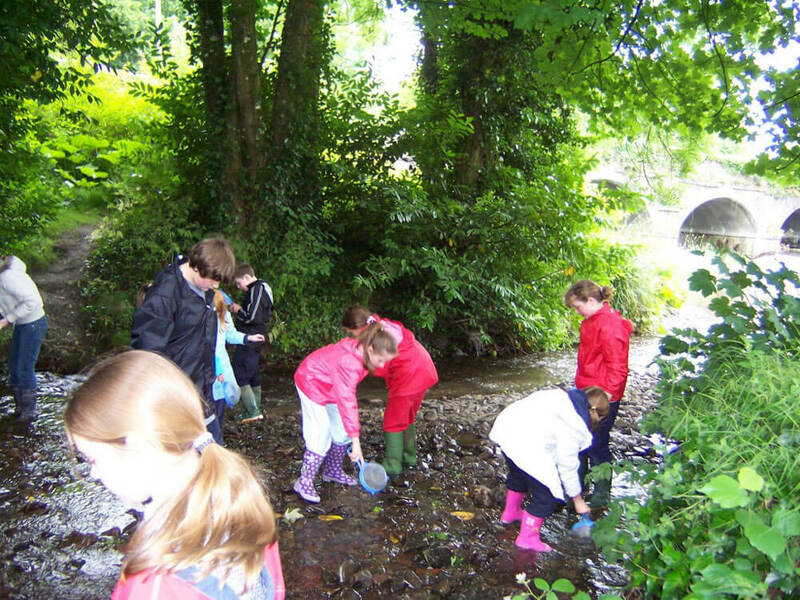 In a shallow area of the River Deen, students will use a sieving technique, to collect, examine and identify indicator species of water invertebrates using classification keys before releasing the ‘mini water beasts’ back into their natural habitat. From the types of water invertebrates recorded, students will try determine the river’s water quality. This activity is suitable for all class groups. Active teacher participation & group monitoring in the water is essential. Please note: This activity is weather dependent and may not be possible if water level is too high on the day. An alternative activity will be arranged. Wellies are required for all participants (change of socks and/or clothes strongly advised). Questioning, Observation, Capture and Release techniques, Recording, Analysis, Classification, Investigation, Reasoning, Communication, Teamwork. 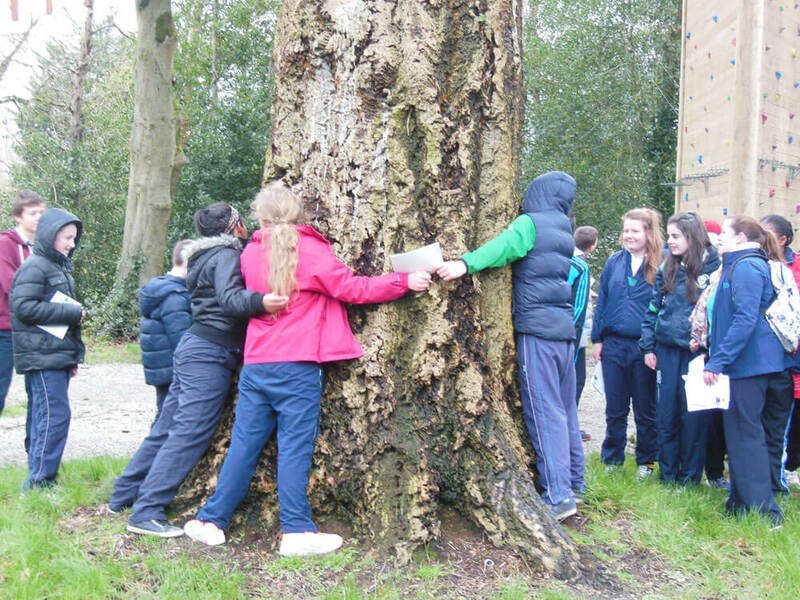 A guided walk of the woodland incorporating a scavenger hunt with other nature-based activities. 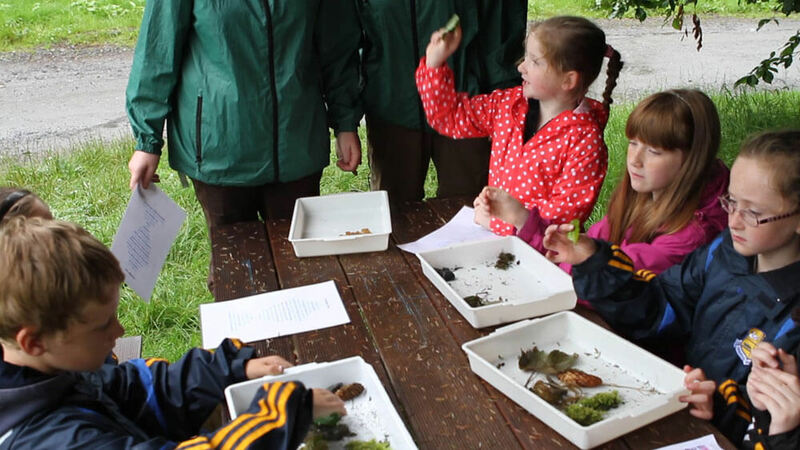 An inquiry-based learning approach is used as students are tasked with observing, identifying and recording a selection of common plants, animals and other natural objects. Depending on the age group, we tailor the content to suit and may include an introduction to invasive species in the woodland (e.g. Laurel, Rhododendron), the impact of humans on the landscape and our Leave No Trace Policy. Observation, Analysis, Identification, Recording, Investigation, Communication, Teamwork, Sensory awareness. A basic but exciting habitat study of the plant and animal life in our woodland which is adapted to suit all class groups. Students may use pooters, sweep nets, beating trays, cryptozoic traps and other equipment to capture, identify, record and release woodland invertebrates and other flora and fauna. Depending on the age group, a tally record system may be used to record and classify the ‘mini-beasts’ and the concept of adaptations in species will be introduced. Questioning, Observing, Analysis, Classification, Investigation, Recording, Communication, Selection of Sampling Techniques, Teamwork. 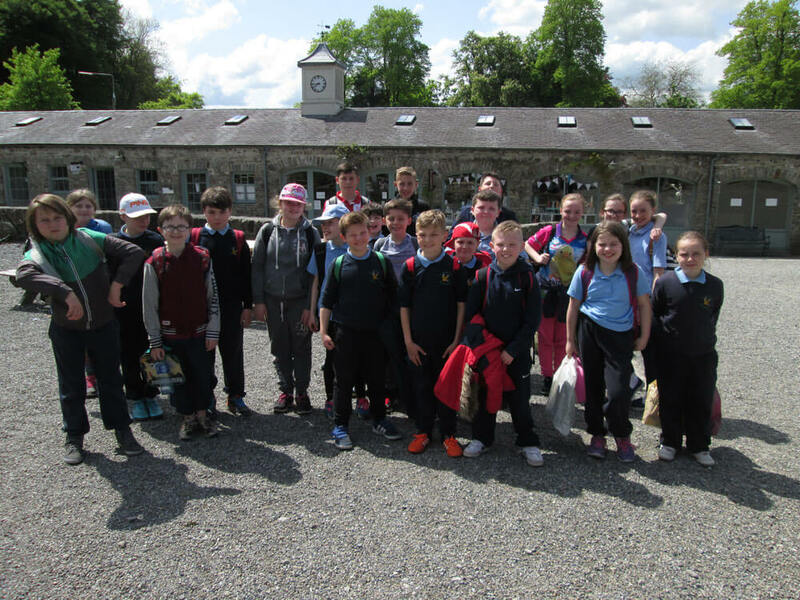 Using the outdoor space of Castlecomer Discovery Park, students work as part of a team to solve and understand a series of mathematical problems along a guided woodland trail. Students will explore mathematical topics in a real-life setting (e.g. basic numeracy, shapes, patterns, probability, measurements, reasoning, geometry). This activity aims to bring maths to life for students in a fun and interactive way to show how and where maths knowledge can be used in ‘real-life’. This activity is suitable for 2nd class upwards (not available during School Tour season, May & June). Numeracy, Observation, Counting, Estimation, Sorting, Ordering, Comparing, Recording, Connecting, Problem-solving, Reasoning, Implementing. 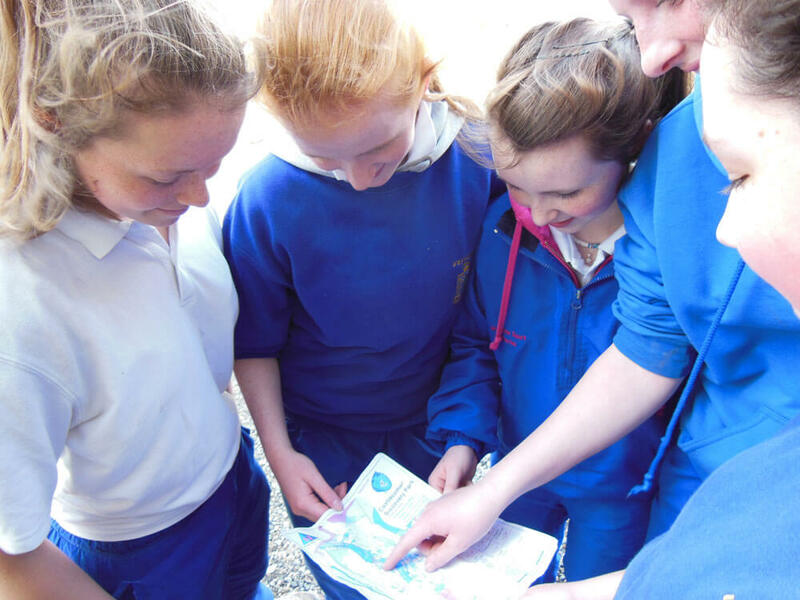 This activity introduces students to basic map reading skills such as symbols, direction, topography and scale. A variety of maps will be shown to highlight the uses of maps, to identify different natural and man-made features in the environment and to encourage a sense of place. Students are then tasked with creating their own visual representation of a map as part of a small team using materials found in the woodland. Once the map has been created, students will then explore and interpret each other’s maps before introducing and presenting their representations to their classmates in a short ‘show and tell’ exercise. Suitable for 2nd class upwards. Geographical Investigation Skills, Questioning, Observing, Imagining, Analysing, Measuring, Estimating, Expression, Sense of Place, Reasoning, Spatial Awareness, Communication, Teamwork. Price: Primary €5 pp, Secondary €6 pp. A guided tour of our interactive multimedia exhibition which charts the formation of coal through various environmental conditions over 300 million years ago. Students will see the processes that have shaped the Earth through time and discover geology, prehistoric flora and fauna and see amphibian fossils in our fossil room. Students will also hear about the Wandesforde Estate and the related historical and industrial heritage. You can even crawl through our mini-mining tunnel to experience the working conditions and methods of a coal miner. This experience is best suited for 1st class upwards. Price: Primary €4 pp, Secondary €5 pp. * Please note: Zipline is not available for Primary School Tours unless all students meet age (12 yrs) & height (1.3m) requirements. It’s never too early to book your School Tour, we book out early! To book please contact our Education Officer, Nichola: educationofficer@discoverypark.ie or call 056 4440707 to speak with a member of our Education Team. We’d be delighted to create a tailor-made day for your class or whole school. We cater for groups of all sizes – no upper limits!